Young Billy Batson is an orphan with a persistent habit of running away from foster homes before he ends up in his last chance home with loving and understanding foster parents and five other foster kids. Chief among them is Freddy, a wise-cracking, self-professed superhero expert and, while Billy tries not to get attached, he can’t help himself defending Freddy when the local bullies torment him. Billy runs and ends up being transported to the Rock of Eternity where the wizard Shazam grants him his powers to save the world from the Seven Deadly Sins that have been released by Dr Sivana. Billy gets back to the real world and confides in Freddy that he has powers; Freddy’s response is to film Shazam testing those powers, uploading the clips to the net and basking in the views. Eventually, though, Sivana comes calling, wanting Shazam’s powers for himself. Cue various fights before the big finale where Shazam gets some help from some others and – no real surprise – defeats the bad guy. Story-wise it’s not a great deal more than that, but that’s not saying it’s bad by any means. Most of the main characters have enough screen time; Rosa and Victor (the foster parents) seem to genuinely like their rag-tag family of kids; and the leads of Billy, Freddy and the adult Shazam are clearly having a blast – the last two particularly. And it’s funny, too – not belly achingly hilarious, but enough to make me smile and chuckle plenty of times throughout; the big villain speech scene towards the end was great, for example. It’s clear that with this, Zack Snyder’s grimdark version of the DCU has finally been laid to rest, and not a moment too soon. A little slow in some places, and a little too long in others, it’s still a fun film so gets three lightning bolts out of five. 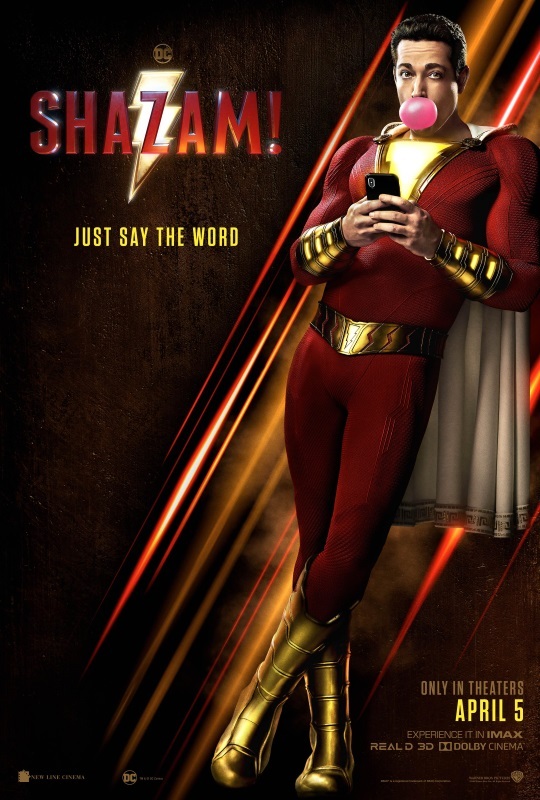 Posted on Thursday, April 11, 2019 Tuesday, April 9, 2019 by GaryPosted in Film/TV, ReviewTagged Captain Marvel (Billy Batson), Shazam.